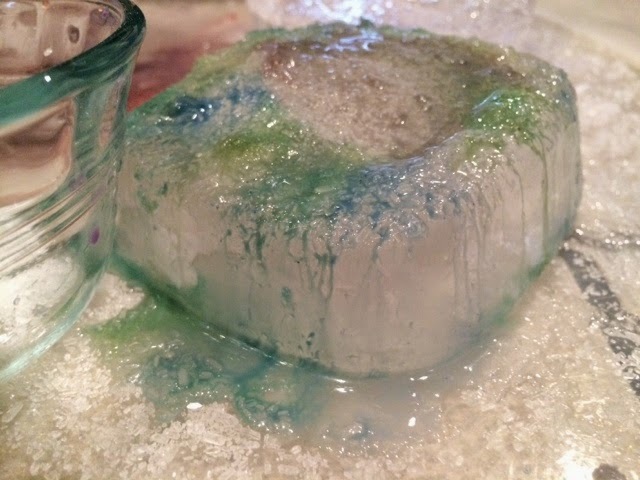 Mack enjoyed learning about erosion with our backyard project a couple of days ago so I decided to follow it up with another ‘erosion-inspired’ science experiment. 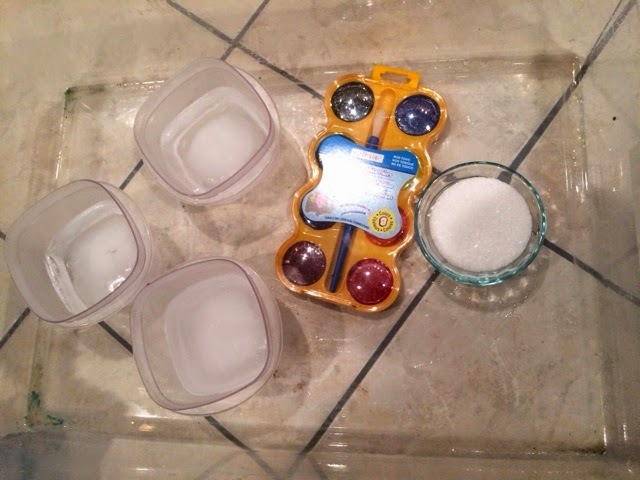 We used ice, epsom salt and watercolors to explore the effects of combining these ingredients. 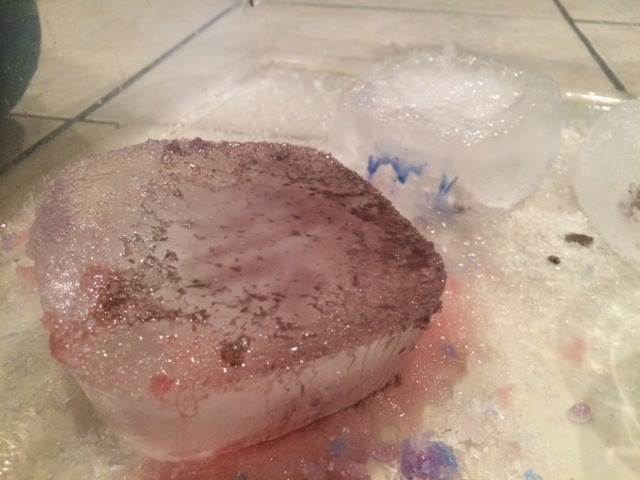 I froze some blocks of ice in tupperware containers so that they were about 2 inches thick. 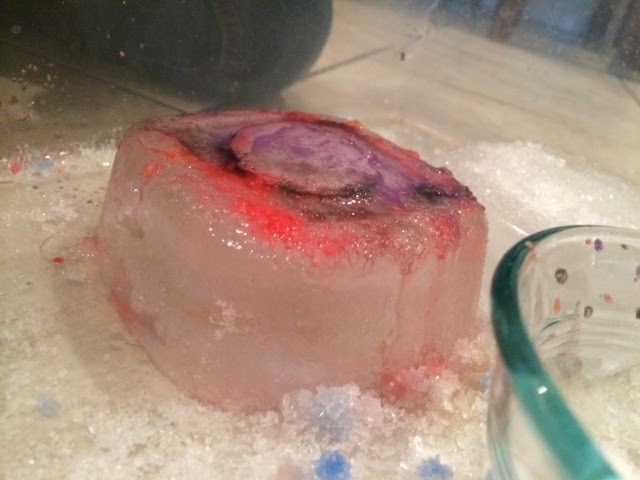 This worked well and allowed Mack to play with it for a while before really melting, however a thin sheet of ice would have probably exhibited the science a bit better. Aside from the ice, you really only need some salt; you could use any kind of salt, kosher, table, epsom etc., we chose to use epsom just because it was different and I happened to have a lot on hand! 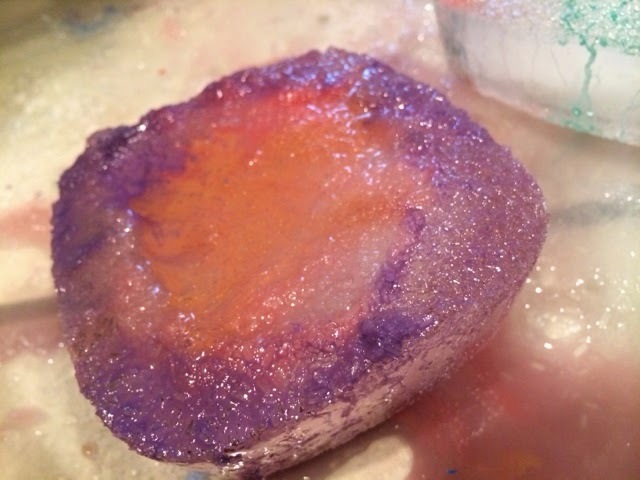 We chose to use these new glittery watercolors to paint our ice but food coloring and water or liquid watercolors would work just as well. This activity can get a bit messy so doing it inside of a bin or on a baking sheet will make clean-up the easiest! 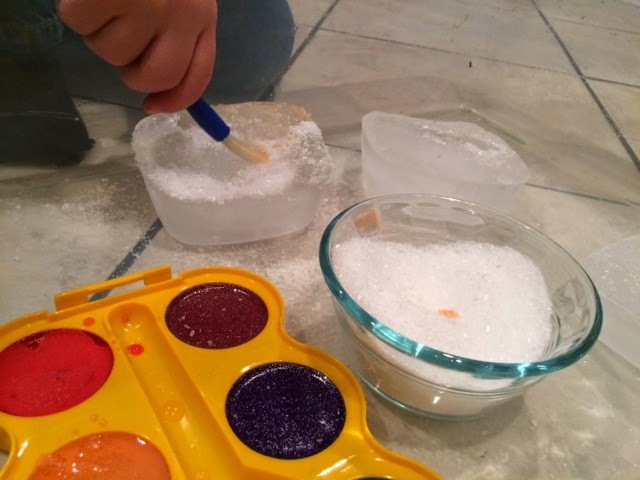 Mack started by sprinkling the salt on the ice blocks and rubbing it around the ice. This was a nice sensory experience in and of itself! 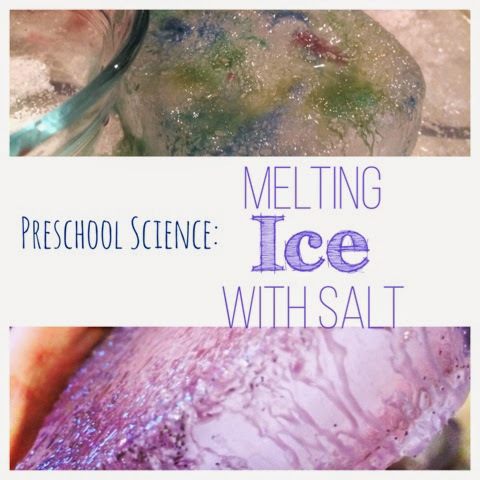 Once the ice blocks were covered in salt we began to see some reactions. The salt started to create holes in the ice along with what we called creeks. Our previous experiment focused on soil erosion and how running water exposed tree roots, we compared this experiment by finding creeks and areas of running water within our blocks of ice. 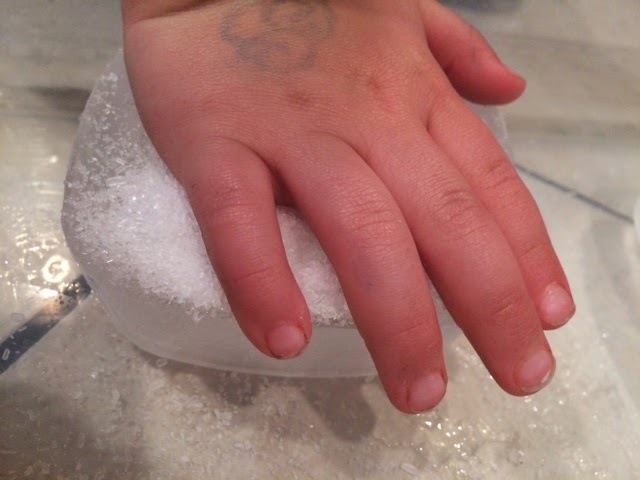 I didn’t get into the specifics of why salt melts ice with Mack because he is only 3, but in case you are curious it is because the salt lowers the freezing point of the water. Funny enough at the same time it makes the water (ice) colder which is why it is used in ice cream makers! You can see in these pictures the difference the paint makes in what you are able to observe! Not only was this fun but the ice blocks were actually beautiful and the experiment kept Mack occupied for almost an hour!! 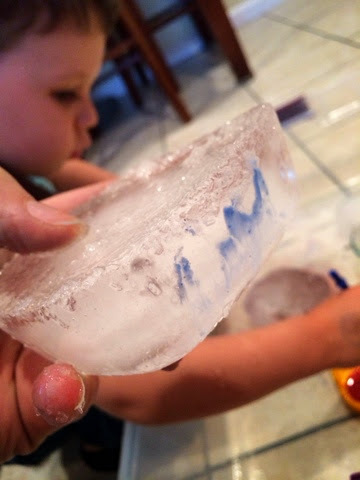 And while the salt is melting the ice, like I mentioned before at the same time it keeps it colder, so the ice blocks did not melt within that whole hour allowing him to play with them for as long as he wanted to!